Paavo Nurmi, Larysa Latynina, Mark Spitz, Carl Lewis, and Michael Phelps each had 9 Olympic gold medals; until tonight that is. This evening American swimmer Michael Phelps stands alone. He became the first athlete in Olympic history to win 10 gold medals by winning the men’s 200 meter butterfly in another world record of 1 minute 53.70 seconds. With the ease that has become his habit, Phelps bested a world-class field to claim his record-setting gold medal. Less than 50 minutes later he snared gold medal number 11. He swam the lead off leg and led the U.S. men’s 800 meter freestyle relay team in obliterating the world record and the rest of the field by nearly five seconds. The U.S. men became the first team ever to break the 7-minute mark in the event. 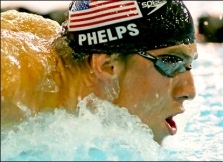 In the process, Phelps also set his fifth world record in five events and surpassed Jenny Thompson as the most decorated swimmer in U.S. Olympic history. His success is no accident. Throughout the games the media has talked about his commitment, his single-mindedness during the past four years in preparation for his day in the sun. Tonight all that hard work paid off. Phelps has already secured his place among the immortals. Before these Olympics are over, Phelps may have enough gold medals to be in a class all by himself. The only question remaining is who will play Michael Phelps in the Hollywood version of his life. Michael Phelps is proof that when belief, talent, and determination meet dreams come true.